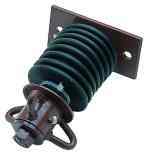 Commercial swing components and swing parts, from the top suppliers in the playground business. These commercial swing parts are tough, durable, and reasonably priced. These parts are hand-picked by Certified Playground Safety Inspectors (CPSIs). Unlike many sellers of discount commercial swing parts, we will never sell factory seconds or used parts. 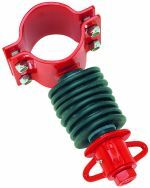 You’ll like our commercial swing hangers so much, we think you’ll order swing parts from us time and again! Your swing hangers get put to the test every day by the kids at your school or daycare, so make sure you get top quality commercial swing hangers from us. They’re easy to install, with only basic playground tools. We even offer playground safety mats and ADA compliant swing seats and parts, for all your playground component needs. So, you can rely on Maryland Materials for commercial swing parts and components that stand up to the test of time — and the kids! Are you tired of kids looping swings around the horizontal beam, so no one else can use them? 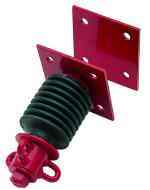 Here’s the answer: our Vandal-Proof Swing Hanger. 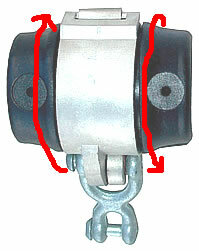 The metal swing clamp sits on a track in a rubber sleeve, and it rotates around the sleeve. So, when someone loops the swing-seat over the bar, the swing hanger just spins back to ground level. There are two diameters available: 2-3/8″, and 3-1/2″. The hanger has our E-Z Hang feature: a pendulum with built-in clevis, so you don’t need a swing connector — just slip the top link of the swing chain into the clevis, tighten the clevis, and start swinging! you’ll need connectors (see below).